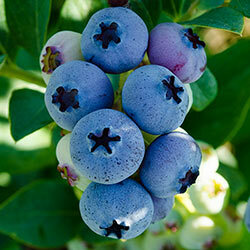 Elliott Blueberry - Fruiting Plants | Michigan Bulb Co.
Take blueberry season into extra innings! Here's a delicious variety that allows you to enjoy blueberry season just a bit longer. Its flavorful, half-inch berries can be used in baked goods such as pies and cobblers, added to pancakes or eaten fresh as an antioxidant-packed snack. Light blue fruit starts ripening in July and continues into September. This shrub grows to 4–6' and is winter hardy. Very ornamental when its pink-tinged blooms open in the spring and its stems turn burgundy-crimson when cold weather arrives. Plant it in acidic soil where it gets full sun to achieve best growing results. Ships now, garden ready, in a gallon pot. Foliage Type: Ovate, medium green leaves (to 3" long) turn attractive shades of yellow-orange to red and purple in fall. Pruning: Prune as needed in late winter beginning in third year after planting.